If you're like us, you have probably listened with trepidation about the collapse of honeybee colonies -- a sad and mysterious tale with real consequences. Without bees, pollination gets out of whack, and so do crops and the rest of the ecosystem. The trajectory of the story is not unlike that of global warming's -- doom and gloom or natural cycle -- especially when you add a recent study published on New Scientist. It turns out that the plight of the honeybee isn't that bad after all. The researchers in the article took the three main tenets of the "pollination crisis" and debunked their gravity. First, the claim that pollination by bees sustains a large percent of food crops is untrue, they contend. The majority of food crops either depend on animal pollination or pollinate themselves. Second, they point out that the claim that pollinators are experiencing a catastrophic decline is based on extreme regional examples. They say that any decreases have been offset by increases elsewhere. 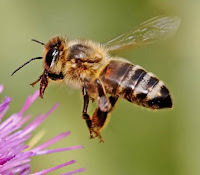 Third, they question the claim that a small number of pollinators would affect agricultural productivity at all, pointing out that crop yields have steadily increased the past few decades. So, is there a world-wide bee crisis, or not? The authors of the article make mention of how the crisis "is a great story that taps into the anxieties of our age." Is all the hype, then, merely a yarn spun with baseless fears and anxieties? Or, is this a case of global warming v. climate change? Here is a video from two years ago put out by PBS called "Silence of the Bees." It talks about honeybees as a "keystone species" and the mindset shift needed to reverse their decline. This is an interesting post. I wonder if it's propaganda from anti-global warming people or something more reliable. Either way, it's got me confused! It's good news in a way. And it does make sense, it wouldn't for crops/plants to rely solely on one source for pollination. "The Walls Talk When the Media Lies"